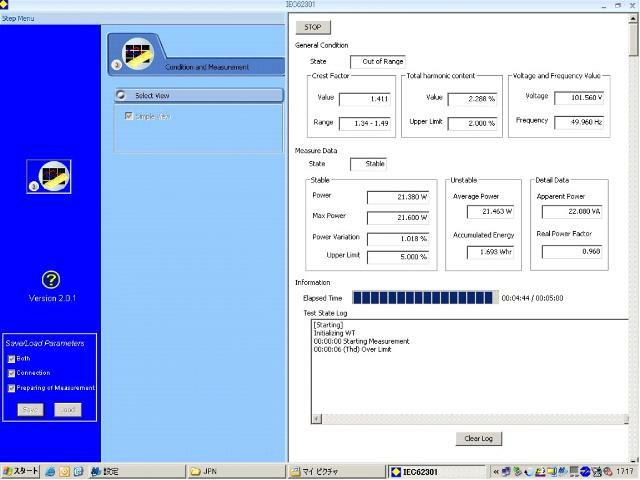 Now at Yokogawa we have a comprehensive solution with our new standby power consumption measurement software. Meets the Requirements of IEC62301 Ed2.0(2011) Household electrical appliances - Measurement of standby power and EN 50564:2011 Electrical and electronic household and office equipment – Measurement of low power consumption. New standby power consumption measurement software that conforms with the testing methods specified in the IEC62301 Ed2.0(2011) standard and EN 50564:2011 has been introduced for the Yokogawa range of digital power analyzers. The new software, available for the Yokogawa WT series*, allows the user to perform measurements according to IEC62301 Ed2.0(2011): Household electrical appliances - measurement of standby power and EN 50564:2011 - Electrical and electronic household and office equipment – Measurement of low power consumption. 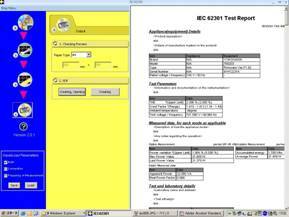 The software sets up the appropriate test conditions by 3 type measuring mode(Ed1.0/Ed2.0(auto)/Ed2.0(manual), measures the power values, and creates a test report based on the requirements of the IEC62301 Ed2.0(2011) and EN 50564:2011 standards. Key parameters measured and incorporated in the test report include total harmonic distortion(THD measurement), crest factor, RMS voltage, frequency, measurement period and power. 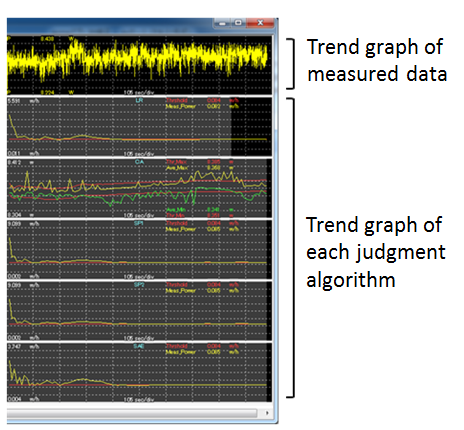 By combining the power consumption measuring software with WT series*, you can perform the measurements according to IEC62301 Ed2.0(2011)(Household electrical appliances - Measurement of standby power) and EN 50564:2011 (Electrical and electronic household and office equipment – Measurement of low power consumption). The software not only inputs the testing conditions and measures the power values, but also make a testing result report based on IEC62301 Ed2.0(2011) and EN50564:2011 standards. You need to input model name,manufacture, and finally make report. Trend graph display (when Standard is set to IEC62301 Ed.2 (Auto), EN50564:2011 (Domestic appliance), or EN50564:2011 (Other)). A trend graph is drawn in conjunction with the starting and stopping of a measurement. A report of power measurement results can be saved. 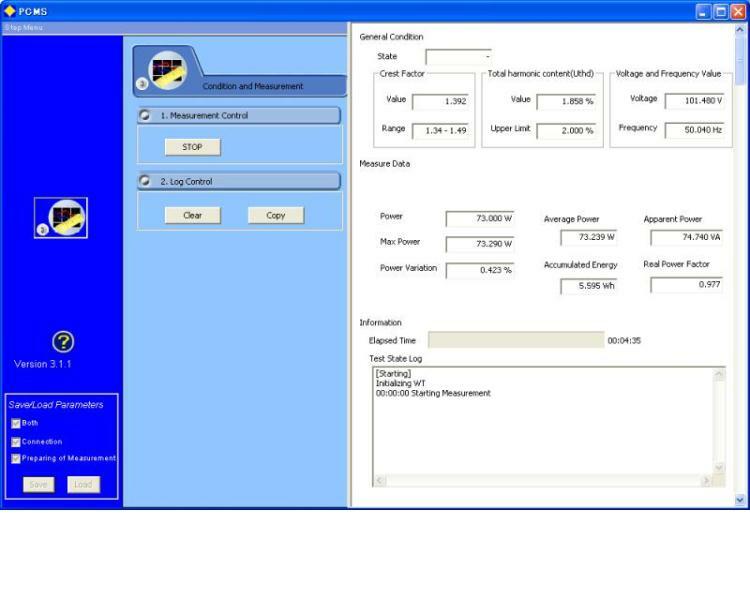 You can perform measurements that comply with various ratings. The Test Report provides data for Total Harmonic Distortion(THD), Crest Factor, Voltagerms, Frequency, Time period of measurement and Power. * 32-bit versions and 64-bit versions are supported. 1 On Windows Vista or Windows 7: Use driver NI-488.2 Ver. 2.7.2 or later. On Windows 8 or Windows 8.1: Use driver NI-488.2 Ver. 3.1.0 or later. 2 On Windows Vista or Windows 7: Use driver NI-488.2 Ver. 2.8.1 or later. 3 Use driver NI-488.2 Ver. 14.0 or later. Devices supported by the operating systems listed above.